Tzeentch was created and sustained by the desire for change that is an essential part of nearly all mortal life; almost all species are aware of the concept of a better tomorrow, and any form of dreaming, imagining or resolution for change empowers the Chaos God. Like the other Chaos Gods, Tzeentch is strongly interested in humanity due to the power and drive of the human spirit and how that uniquely ties into his interests; no creature is more volatile or more ambitious. The spark of wishing for a different existence can turn into a fire that can change a country, a world, and perhaps ultimately an inferno that can alter the fate of galaxy itself; this is Tzeentch. Magic is essentially an expression of change driven by will, and as such is the domain of the Changer of the Ways; Tzeentch is the greatest magician in all of the Warp. Many of those drawn to his auspices are sorcerers, while many others will be gifted with sorcerous powers as a reward for their actions. Tzeentch's daemonic aspects are essentially creatures of magic rather than any sort of conventionally understandable physicality. As well as an interest in magic, Tzeentch takes keen notice of all plots and plans. As the Great Conspirator, he is aware of all the dreams of plans and mortals. This is how Tzeentch is able to perceive the future; by being aware of all that is planned and all that may potentially happen, he can see all possible fates. Wishing to be involved with the fates of existence, Tzeentch directly and indirectly interferes in the fates of all things. His intentions are unknown, his schemes insanely complicated and his plans so extraordinarily long-term it may be that none other than he will ever see the end of all of them. 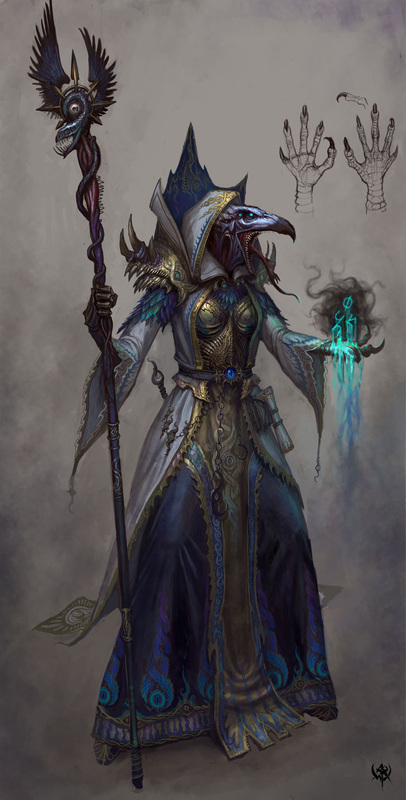 It is often claimed that Tzeentch wishes to extend his power over the Materium, or to defeat his brother Gods; however, it is the nature of Tzeentch to care just as much about altering the fate of a single individual. Tzeentch's schemes also often appear contradictory to those who discern them; this is because only Tzeentch can understand his own interests and perceive the full possibilities of each action. Tzeentch has as many depictions as he has names. His skin is said to constantly shift and roll with faces, faces that leer and express mockery. As Tzeentch speaks, these faces repeat what he says, but with different inflections, or a word different here and there, or in fact provide running commentary or analysis on what he is saying; this makes it almost impossible to be certain what meaning Tzeentch is actually expressing. While these skin-faces come and go very quickly, Tzeentch's actual body is said to be constant; his head is low on his chest as if he had no neck and horns project from his shoulders. Raw magical energy surrounds him like smoke, with the faces and bodies of those whose fates he is considering manifesting before him in subtle and complex patterns. Tzeentch's opposite force in the Chaos pantheon is Nurgle, who stands for despair and the acceptance of one's fate. Such a form of existence is anathema to Tzeentch, who derives power from the will to change one's destiny. Tzeentch is often visualised as the serpent which writhes and twists to represent constant change and this is mirrored in his symbol with curves and points to represent change and conclusion.